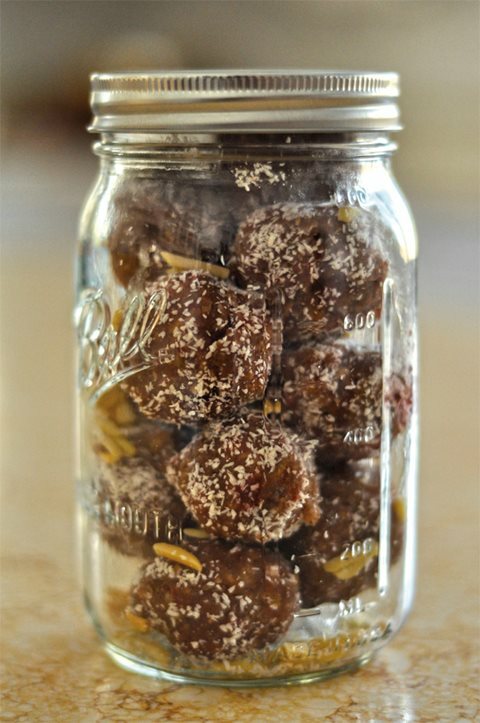 Coming to the Caribbean island in the late 19th century with Afghan workers, balls of maleeda are made with shredded paratha roti (bread), and Trinidadians have adopted it into national fare with variations that include spices and a topping of ground coconut. Mathematics may have been her profession, but now maleeda is one of Nazira Ali’s passions. Rolling dough and baking, she makes the traditional sweet to share on Muslim holidays and also to send with pilgrims leaving her native Trinidad for the hajj in Makkah—with the provision they deliver some to her son, who lives there. Maleeda is a sweetened dough ball made from a soft Indian griddle bread called paratha roti that first came to this Caribbean island in the late 19th century with Afghans, many of whom arrived as indentured servants, as well as with Muslims from India. Ever since then, Trinidadian maleeda has been adapted, like so many of its foods, to local tastes and ingredients such as coconut, cinnamon and clove, which are ubiquitous in Caribbean sweets—the latter two originally hailing from Southeast Asia. Although maleeda is to Muslims a special dessert for Muslims during Ramadan, the month of sunrise-to-sunset fasting, non-Muslim Trinidadians welcome it, too. Zalayhar Hassanali served as the island nation’s first lady from 1987 to 1997. She is widely credited with the betterment of social relations among Muslims and non-Muslims—an accomplishment in which food and cooking played a part. “When I became First Lady, I served East Indian, Chinese, Creole and Syrian foods at state dinners to demonstrate our nation’s diversity,” she says. The two-island country of Trinidad and Tobago, the southernmost islands in the Caribbean chain, is a nation of many cultures. Just 13 kilometers off the coast of Venezuela, Trinidad was among the few places Christopher Columbus actually dropped anchor, and it quickly became a prize in the colonial battles for the New World. Initially colonized by Spain, it was taken by France and, for its longest period, England. The colonial powers brought enslaved Africans here and, later, indentured Chinese and Indians of Buddhist, Hindu and Muslim faiths, all to work on the sugar and cocoa plantations that built Trinidad’s first fortunes. (Today nearly half the island’s economy relies on oil and gas.) Cocoa laborers were recruited also from Venezuela, and, later, refugees from Syria and Lebanon found their way to these shores in an ongoing immigration that began in the late 19th century and continues today. 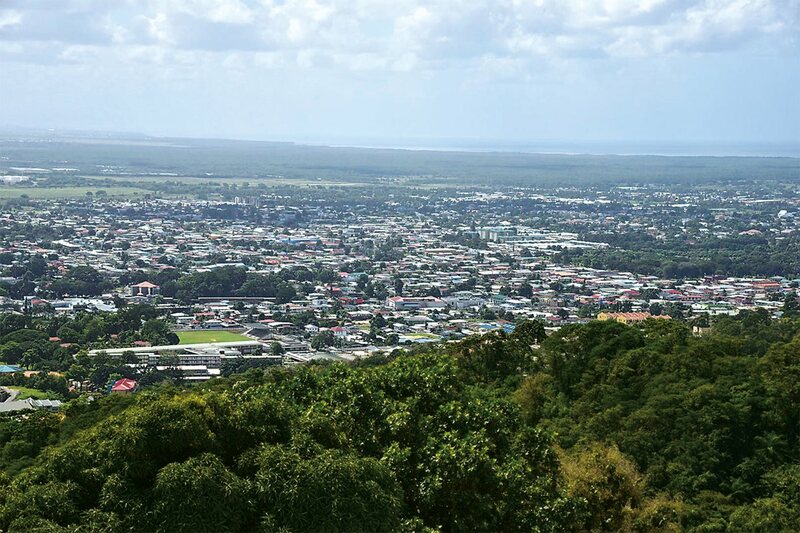 Spread below mountainous northern Trinidad lies the Caroni plain, and beyond its towns and cities stretch the once-vast plantations of sugar and cocoa that made Trinidad a contested prize among rival Spanish, French and British colonial powers. Each brought enslaved and indentured peoples variously from Africa, Asia and South America, leading to today’s shared palate of tastes that is as varied as the island’s history. Second to Christianity, Islam is the longest-practiced religion in Trinidad. The first known and, later, most prominent Muslim was Yunas Mohammed Bath, an enslaved West African from the area between the Senegal and Gambia rivers. Literate in Arabic, he arrived in Trinidad around 1805, and he quickly became a leader among fellow enslaved Mandingo (Muslim) Africans. 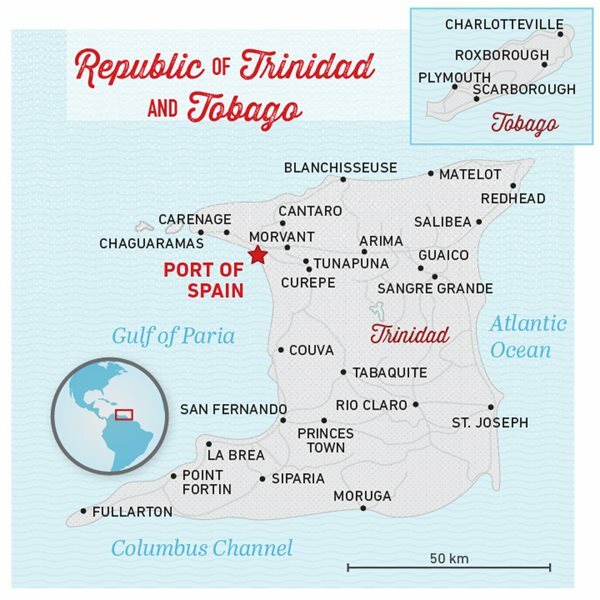 A decade later Africans who were originally enslaved in Georgia and the Chesapeake region of the us arrived in Trinidad, where they were granted their liberty and some land along the eastern shore as payment for military service to Britain during the War of 1812. 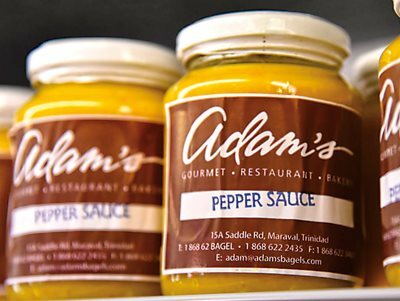 Adam Abboud’s family-owned pastry shop in Port of Spain attracts a loyal clientele that comes for herbs and spices imported from Syria and Lebanon as well as uniquely local family recipes like Adam’s pepper sauce, which he tuned to Trinidadian tastes. Today eastern Trinidad remains a largely Muslim and mixed-race enclave, bolstered in the mid-19th century by indentured servants hailing from what is now Pakistan and northern India. As with all of the faiths, ethnicities and cultures that make up Trinidad today, it is food that most often provides opportunities for fellowship and understanding. “Growing up, I remember that it was always the men who would make the paratha roti for big Islamic functions—weddings or holy days. 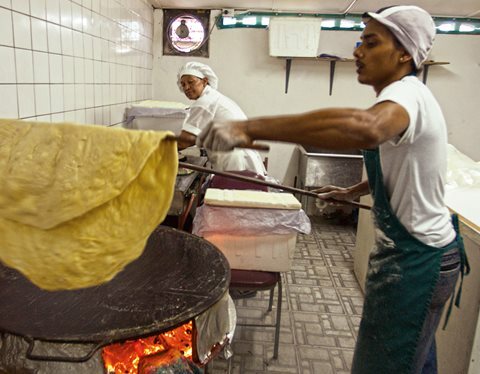 They were the experts, so when anyone had a function—even if they were Hindu or Christian—the Muslim men were called upon as the best paratha roti-makers,” says Ali’s daughter Safiya, an attorney with Caricom, the Caribbean Community Secretariat, which promotes policy and development among 15 Caribbean nations. Safiya blogs about Trinidadian food on “Life-span of A Chennette,” and her mother tests recipes after reducing them from the large volumes used to prepare food for crowds at the mosque. Food continues to represent mutually influential exchanges among Muslim and non-Muslim Trinidadians. In a large pot, cover fish with cold water and bring to boil. Simmer 20 minutes. Drain and repeat two more times to soften the fish and remove most salt. Put the drained fish in a large bowl and shred it with a fork. Mix in onion, garlic, pimento and tomato. Add cilantro and ground pepper. Mix and refrigerate about 1 hour. 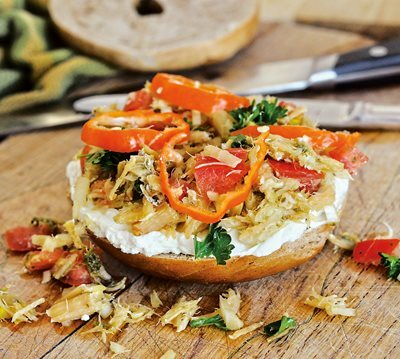 Slice the bagels and smear with labneh. Top with 2 to 3 tablespoons of buljol; top off with slices of scotch bonnet pepper. In the same vein, notes Safiya, whenever there was a large function in the village that required the help of women—perhaps for the ceremony beginning a Hindu wedding, or the celebration of Diwali, the Hindu festival of lights—all the ladies in town were called upon, and her mother, Nazira, especially was asked to join in making sweets. “We didn’t participate in the fetes or dancing, but when there was a village ceremony, we participated in the cooking because we were part of the community,” says Safiya. She adds that she, her mother and sisters could help all the more easily at Hindu functions because they were vegetarian affairs, thus mooting any question about Islamic halal dietary codes concerning meat. Many point to the presidency from 1987 to 1997 of Noor Hassanali, the country’s first Indian president and the first Muslim head of state in the Americas, as a watershed in the history of social relations among Muslims and non-Muslims in Trinidad. It was the efforts of his wife, First Lady Zalayhar Hassanali, often made through food, that perhaps provided the most tangible opportunities for cultural and culinary cross-pollination. 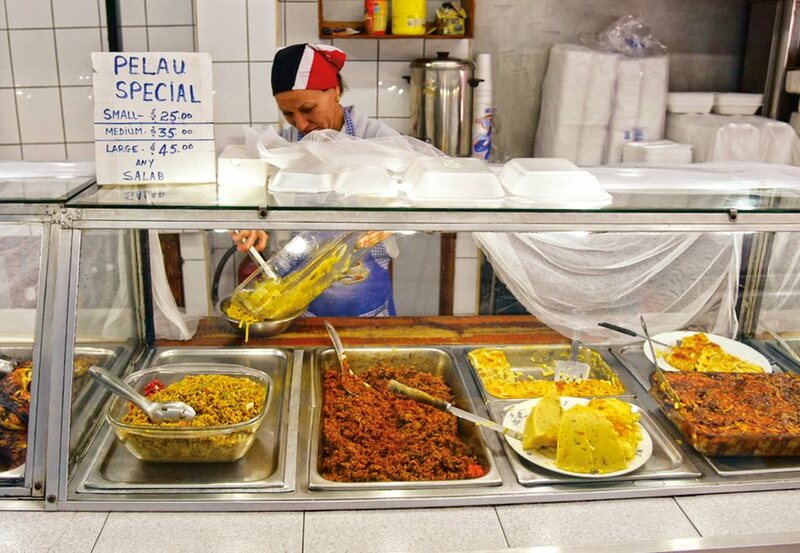 An informal café sells three serving sizes of pelau, the Trinidadian favorite that plays off Indian biryani but is browned in syrup in an African style and seasoned with Trinidadian “green seasoning,” hot pepper and coconut milk. While there was at first some concern about how dignitaries both at home and from abroad would accept this, Hassanali says people respected the couple’s decision—including Great Britain’s Princess Anne, whom Hassanali recalls enjoying the First Lady’s freshly pressed juices from fruits grown on the presidential estate. “Even though it was shocking to many for a head of state to create a restriction about things that are so integral to Western diplomatic etiquette and there were those who frowned on it, in the end people respected the Hassanalis’ decision,” says hotelier Gerard Ramsawak, who is also a founding member of a multicultural outreach association the works with the office of the president of Trinidad and Tobago. Local food blogger Trinigourmet, Sarina Nicole Bland is among the small Jewish community in Trinidad. 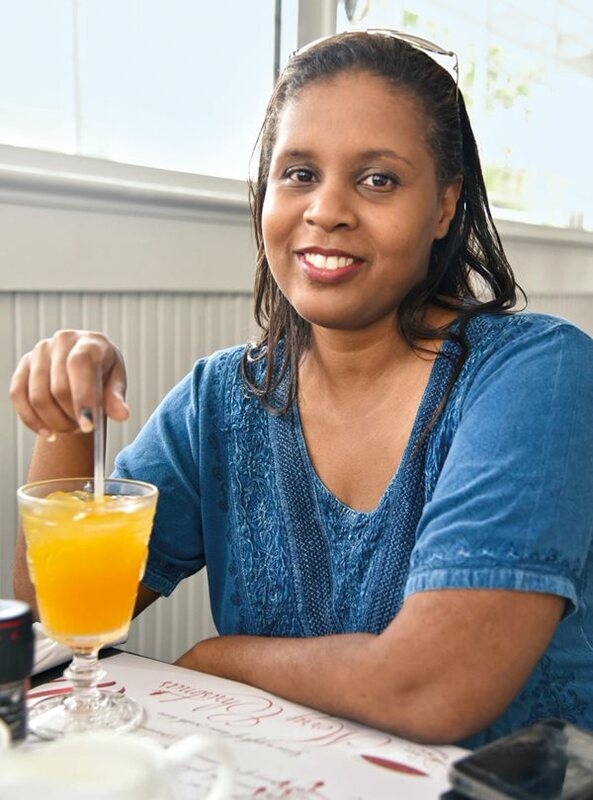 The food bonds created by Trinidad’s multi-ethnic society are something she appreciates, noting that the rules of halal and kosher are similar enough that the islands many halal restaurants provide an opportunity for her to eat out. As manager of Pax Hotel, a historic building on the grounds of Mt. St. Benedict, one of the island’s oldest monasteries, Ramsawak regularly attended state dinners that included diplomats, artists and business people throughout President and First Lady Hassanali’s tenure. “Mrs. Hassanali’s secret was that she embraced the larger culture of Trinidad and Tobago—a culture that is a melting pot where we’ve learned to appreciate each other’s differences,” he says. Today food continues to represent mutually influential exchanges among Muslim and non-Muslim Trinidadians. While in the past most non-Muslim Trinidadians enjoyed Muslim foods, largely thanks to the generosity of Muslim neighbors and friends, some foods have become such a common part of daily life they are readily available to all. The sawine that is a must-have for Muslims at ‘Id al-Fitr has become so popular that major Trinidadian food manufacturing brands such as Chief and Sheik Lisha sell packaged, toasted vermicelli with premeasured spices so that anyone can make the dessert at home. 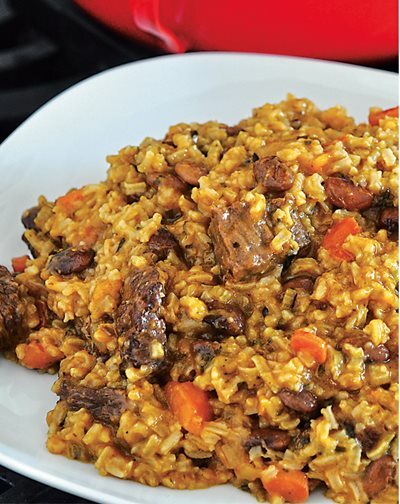 Pelau really exemplifies Trinidadian cuisine’s fusions. A variation of East Indian pilau, which originated in Persia, it is very similar to the biryani of the court of the Mughal emperors in India. (Its name likely came from birinj, the Persian word for rice.) The process of browning the meat in sugar is an African tradition, and although ketchup is a New World addition, it may have its basis in tomato chutneys brought to Trinidad by the English. If using dried peas, soak them overnight in 3 cups of water. Drain. Bring 3 fresh cups of water to a boil in a saucepan and add the peas. Simmer for 15 minutes, or until cooked almost completely through. Drain and set aside. If using canned beans, drain, rinse with cold water, drain again, and set aside. Wash the rice by placing it in a colander or fine-mesh sieve and running cold water over it until the water runs clear. (About 1 minute.) Drain well and set aside. Heat the oil over medium heat in a Dutch oven or other heavy, deep pot. Add the sugar and swirl in the pot, stirring constantly. Allow it to caramelize to a dark brown color. Add the beef pieces and stir well to coat. Add the onion and garlic and cook for 1 to 2 minutes, stirring constantly. Stir in 1 cup of water, the coconut milk, bay leaf, green seasoning, parsley, thyme, carrots and scallions. Reduce the heat to medium-low, cover, and simmer for 10 minutes. Stir the rice, squash, peas, hot pepper, ketchup and butter into the beef. Cover and cook for 20 minutes, or until the peas and vegetables are tender. Remove lid and fluff the rice. The rice should be moist but not sticky. The presence of halal meat shops and restaurants throughout the country, frequented by people of all faiths and ethnicities, are another example. Sarina Nicole Bland is part of the island’s extremely small Jewish community. She, too, blogs about the diversity of the cuisine in her homeland. She says she appreciates the ubiquity of halal restaurants, ranging from Chinese to burgers, Indian, barbecue, Arab and more. “I keep kosher, and the laws of halal are extremely similar,” says Bland. 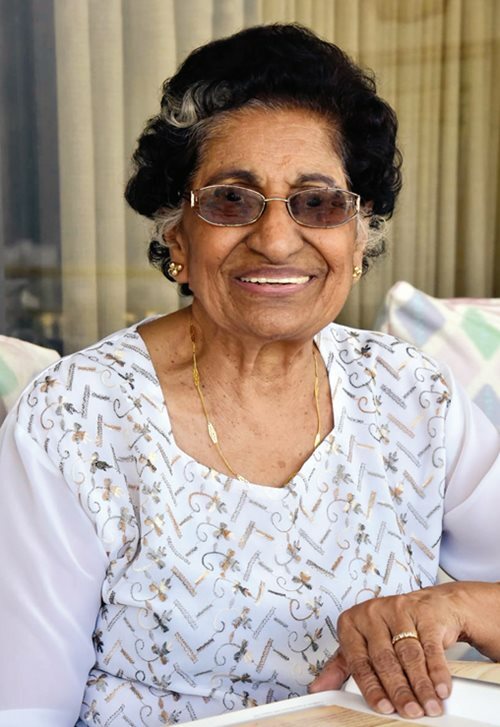 “It makes things a lot easier for me.” Among her favorite Muslim Trinidadian foods is “fat kurma,” another sweet dish that is often brought to mosques for Friday prayers. It is one of the many dishes that demonstrate the subtle difference between foods that are considered Muslim versus Hindu or simply Trinidadian. A crispy fried treat that is coated in sugar, the Muslim version of kurma is more like a tiny doughnut with a crisp crust. Nazira says that paratha roti, which is the forebear to the overwhelmingly popular “buss up shut”—in which the paratha is torn or shredded and has become the default standard to eat with curries—was considered Muslim while dalpuri—in which the paratha is stuffed with ground lentils—was largely thought to be Hindu, and was once only made for special occasions. “Now both are eaten by everyone interchangeably,” she says. Also widely popular is pelau, the Trinidadian version of biryani, a Persian rice dish brought to India by the Mughal emperors. It is an excellent example of the influence, adaptation and evolution of Muslim dishes within Trinidadian cuisine. The layered rice dish is made with meat that is “browned” in caramel syrup in the African style and seasoned with “green seasoning,” a local mixed herb paste, hot pepper and coconut milk. Like the biryanis that are often served in mosques in India, Trinidadian pelau is an incredibly popular one-pot dish that is also often made in mosque kitchens, particularly after 'Id al-Adha (Feast of the Sacrifice), in which cows, sheep and sometimes goats are sacrificed and the meat cooked immediately, while fresh. At the same time, pelau made from chicken or beef is a pan-Trinidadian dish often made for large gatherings and, especially, Sunday lunch with the family. Even as the cuisine of Muslim Trinidadians has crossed over into larger culture and also been influenced by the culture around it, culinary evolution continues. 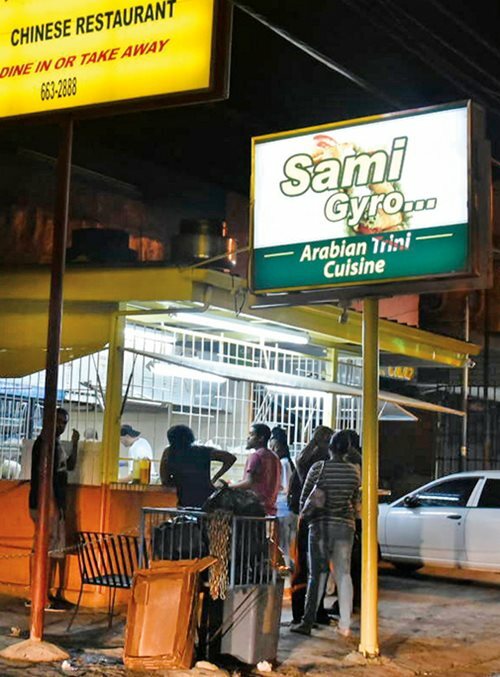 A new wave of “Muslim food” is, again, changing the way Trinidadians eat—mostly in the form of the shawarma stands, locally called gyro (jie-roh), that now line major boulevards in towns, from the capital of Port of Spain in the north all the way down to San Fernando, the large oil-and-gas city in the south and, seemingly, everywhere in between. Almost exclusively the bailiwick of the newest Syrian refugee immigrants, these stands range from independent operators, like Hassan’s, Yousef’s and Original’s, all the way to franchises like Pita Pit and even Lawrence of Arabia. Gyros are rapidly overtaking “traditional” fast-foods like doubles, a curried chickpea sandwich and oyster shooters from mangrove oysters, as the go-to after-party food for the clubbing crowd. 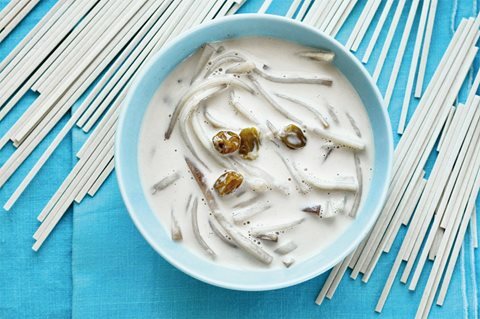 Probably named from saviyan, the Urdu word for vermicelli noodles, sawine is the Trinidadian version of vermicelli kheer, the popular noodle pudding that is served during ‘Id al-Fitr. The Trinidadian version features evaporated milk, which is more common on the island than fresh milk, which was, historically, less available. Cinnamon, candied cherries and “mixed essence”—a popular flavoring for Caribbean sweets—are also featured in this version. Break the vermicelli into 5-cm pieces and place them in a dry skillet over medium-low heat. Toast until golden brown and remove from the pan, about 3 to 4 minutes. Bring 2 cups of water, the cinnamon, cloves and salt to a boil in a large saucepan, and add the vermicelli. Cook over low heat until most of the water is evaporated and the vermicelli is soft, about 10 to 12 minutes. Stir in the evaporated milk, sugar and mixed essence (or substitute). Bring to a simmer, stirring often, until the sugar is dissolved, about 5 to 6 minutes. Pour into a deep bowl and allow to cool. Stir in the almonds, raisins and candied cherries and serve. While for now the fare of this new food community remains fairly true to its ethnic origins, if the history of this island is any indication of the future, then it will not be long until it, too, is adapted, assimilated and in turn influenced. Shankleesh is a homemade cheese made from aging strained yogurt (labneh) that is then rolled in spices and herbs, most often the Lebanese thyme called za’atar. 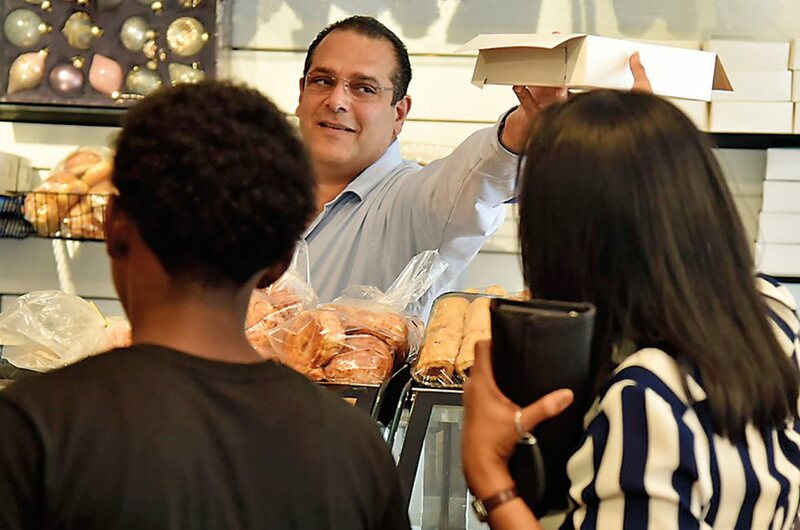 Abboud is the proprietor of Adam’s Bagels, an eatery that bakes Arab breads onsite and serves olives, olive oil, herbs and spices imported from Syria and Lebanon, as well as locally made shankleesh. Safiya Ali agrees. “My mother’s father was a Syrian Muslim who came here in the 1940s, and my mom made plenty of kibbeh and falafel when I was growing up, but I remember having to travel to Port of Spain to get the ingredients she needed. They weren’t so common as they are now,” she says. For Trinidadians, these cultural nuances are just part of what it means to be Trinidadian. Nazira Ali recalls attending mosque school every evening as well as the village Sunday school while she was growing up—with children of all faiths. 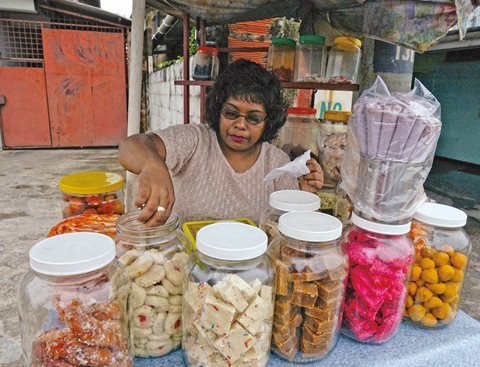 Kurma is an incredibly popular Indo-Trinidadian sweet snack that is sold in roadside stands. However, the version that is publicly sold is a hard crunchy version that is widely different from the Muslim version that is more like a tiny donut with a crusty outside and soft center. In a large bowl, whisk the flour, cinnamon, cardamom, clove and half of the ginger together. Add the butter and, using a pastry cutter or a fork, cut the butter into the flour until it looks like fine breadcrumbs. Mix the evaporated milk and water together and set aside. Add half of the condensed milk to the flour mixture and half of the evaporated milk mixture to the flour mixture and knead the dough until it is smooth, about 5 minutes. Separate the dough into 4 balls and knead again for 2 to three minutes and set aside to rest. Heat the oil in a heavy bottomed pot over medium heat for 4 to 5 minutes. Test the oil by dropping a pinch of flour into the oil. If it sizzles immediately the oil is ready. Roll out one of the dough balls into a rope about 1 cm thick and about 30-40 cm long. Cut the dough on a diagonal into pieces about 4 cm. Fry the pieces in batches until golden brown. Remove and place on a wire rack or paper-towel lined tray. Repeat for each ball. Make the paag (sugar syrup): Put sugar and ½ cup of water to boil in a large pot with the remaining ginger until the sugar mixture spins a thread when dropping from a spoon. Add the remaining condensed milk and boil again until the mixture spins a thread. Place this mixture in a large wide bowl and add the kurma. Stir continuously until each kurma is coated. Transfer to another bowl or tray to spread out a bit so that the kurma doesn’t clump together as it dries. Historically, maleeda was made by Afghan women who said prayers while breaking up the griddle bread in their hands so it will become a nazr (“wish made to God”). In Trinidad, as in its regions of origin, maleeda is used for births, weddings, engagements and other special occasions including ‘Id al-Fitr. On the Caribbean island, coconut, black pepper and maraschino cherries add a twist to the original. Chop the parathas into fine pieces, about the size of rice grains, using a food processor or by hand. Add shredded parathas to mixing bowl with all ingredients except the milk. Mix well, adding milk slowly until the maleeda comes together to be able to form firm balls. Form into balls about the size of golf balls and serve at room temperature. Cover unused maleedas and store in the refrigerator for up to three days. Paratha roti is the soft griddle bread that is served with curries throughout Trinidad. Paratha is a combination of the Indian words parat (“layers”) and atta, which refers to the base flour; roti is an all-purpose Sanskrit word that means “bread.” The method of making paratha roti is to create loyas, or layered cones of dough, brushed with butter paste. These help to make the fluffy layers in the finished roti. Combine the flour, baking powder and salt together in a large bowl. Gradually add water as needed to bring the flour together into a very soft dough. Do not over-knead. Gently knead in 1 tablespoon of the oil, and set it aside to rest for 15 minutes. Divide the dough balls into four equal pieces. Set aside to rest again for 15 minutes. While the dough is resting, mix the butter, shortening and remainder of the oil into a thick paste and set aside. Flour a work surface. Roll out a ball of dough into a thin circle less than ½ cm thick. Brush with the paste and sprinkle liberally and evenly with additional flour. Slice the circle from the outer edge toward the center, and stop slicing at the center. Starting on either side of the cut, roll the dough away from you into a cone shape. Roll the cone into a ball by pinching the edges of the wider end of the ball closed, then pushing the narrow end of the cone toward the wider end and pinching the edges closed. Repeat with the remaining pieces of dough. Let the balls rest for 15 to 20 minutes on a floured surface. Heat a tawa or cast iron griddle over medium heat for 1 to 2 minutes. Test the griddle by dropping a drop of cold water on it. If it sizzles immediately it is ready. Flour a clean work surface generously and roll the rested dough into thin circles about ½ cm thick or a bit less, and place on a tawa or cast iron griddle. Brush with oil and turn over immediately and brush with oil again. Cook the paratha until the surface is bubbled and puffy and then turn over and cook the other side for 1 minute more. Remove from the pan and repeat with all the dough. If making maleeda, shred; if not, serve warm and whole. Ramin Ganeshram is author of Sweet Hands: Island Cooking from Trinidad & Tobago(Hippocrene Books, 2010). Jean Paul Vellotti is a photographer whose work illustrated Sweet Hands and has appeared also in The New York Times, National Geographic Traveler, Caribbean Travel & Life, Islands and more.